Sellout crowd at the Hebrew Center for panel discussion about Gaza and the Israeli-Palestinian conflict. 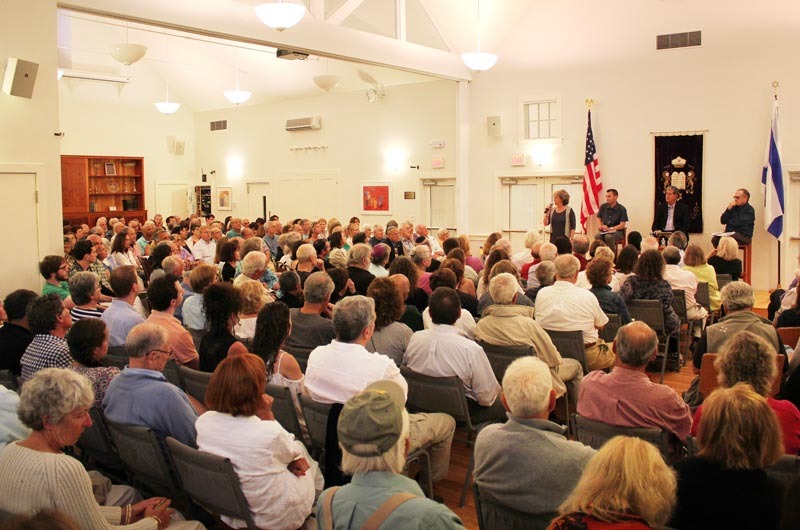 On Tuesday evening, Peter Beinart, Alan Dershowitz and Robert Mnookin gathered at the Martha’s Vineyard Hebrew Center to engage in a panel discussion on Gaza and the Israeli-Palestinian conflict. Every seat in the Hebrew Center was filled as guests listened to the conversation between the distinguished scholars, which at times grew quite heated. The center had to turn away close to 30 guests who arrived after all the seats had been taken. Mr. Mnookin, known for his scholarship on conflict resolution, also moderated the panel. He is a professor at Harvard Law School, chair of the Program on Negotiation there, and director of the Harvard Negotiation Research Project. Mr. Beinart is an accomplished journalist. A former editor of the New Atlantic, he has written for the New York Times, the Wall Street Journal and the Atlantic, among other publications. He has also published three books, including his most recent, The Crisis of Zionism. He is an associate professor of journalism and political science at the City University of New York. Mr. Dershowitz, a summer resident of Chilmark, is a distinguished criminal lawyer, scholar, author and professor emeritus at Harvard Law School. One of the most important questions of the evening came at the end of the panel, when Mr. Mnookin asked for the speakers’ wisdom on what can be done going forward. 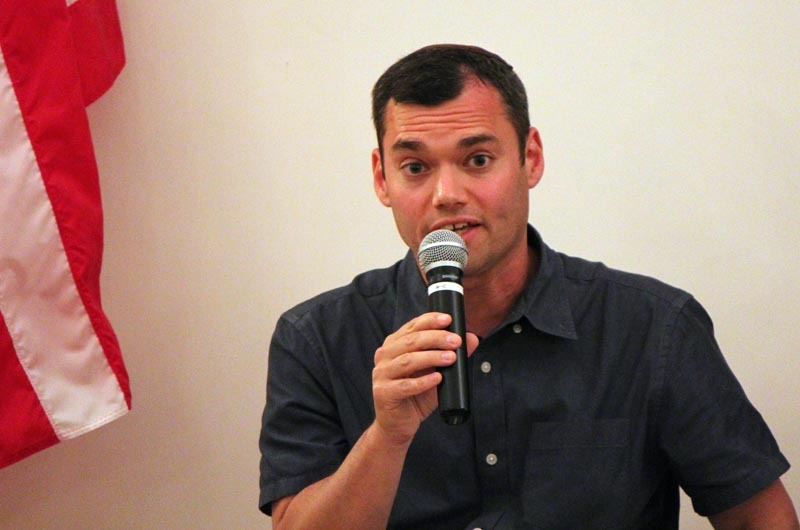 Mr. Beinart suggested that the Palestinians hold an election, and said he would require Hamas to pledge that they would respect the will of the Palestinian people. On the Israeli side, he suggested that the Israelis reach a settlement freeze that includes parts of east Jerusalem, put forth a territorial proposal, and raise money to pay settlers to move back inside the green line. Mr. Dershowitz agreed with part of Mr. Beinart’s argument, saying that now is in fact the perfect time for Israel to make “a generous offer to the Palestinians.” He disagreed with Mr. Beinart’s suggestion that elections be held and is opposed to diplomatic recognition of Hamas or inclusion of Hamas in a government until they state that they recognize Israel’s right to exist and say that they will not oppose them by violence. There was a brief but tension-filled Q&A shortly after. 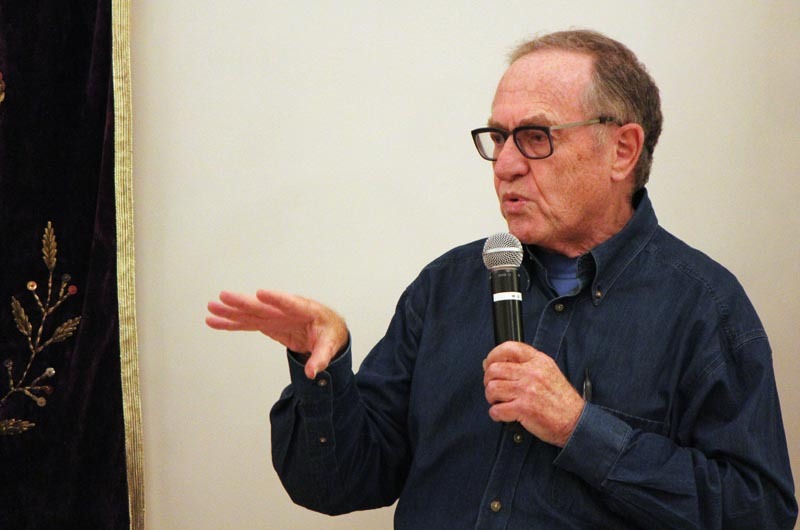 When asked about hope for the future, Mr. Dershowitz said he is optimistic about the possibility of peace with Palestinian authorities, but pessimistic about the possibility of peace with Hamas. “Peter loves to say that the solution must always be political, not military. Sometimes the solution must be military,” Mr. Dershowitz said. “The solution to beat ISIS has to be military. The solution in the second world war had to be military. There is at least a military component. “Without a strong Israel capable of always defending itself and always responding to rocket attacks, there will never ever be peace,” Mr. Dershowitz added. To ease the tension, Rabbi Caryn Broitman asked the crowd to sing Oseh Shalom, a traditional Hebrew prayer for peace and wholeness. “May there be peace for Israel and for all the world,” she said in closing.